With Labor Day gone and school starting up again this week, back-to-school season is in full swing and for students getting ready for their final years in high school, that means considering their options for the college entrance exams. Applerouth Tutoring Services, an Atlanta-based company that focuses on SAT and ACT test preparation, will be offering a free workshop at the 14th Street Y on September 20 to discuss the significant changes that will be made to the SAT this year, as well as a discussion about the differences between the SAT and ACT. Stuy Town resident Nanette Ross, whose children both went to New York public schools, just sent her youngest kid to college but wanted to stay involved with education in the community. By now, most theater buffs in New York City are familiar with “The New York International Fringe Festival,” the mega-festival of plays put on by over 200 companies in 16 days each summer for the past 18 years. However, what’s less known is that there’s also “Fringe Jr.,” a selection of plays in the festival that are geared towards kids. Each show is around an hour and put on by local as well as overseas companies. The venue this year for Fringe Jr., which kicked off August 8 and will run through August 24, is the 14th Street Y. There are four plays to choose from, each one suitable for families with kids ages 5-12, and tickets are $18 for adults, $13 for kids. This is the second time Fringe is showing children’s plays exclusively at the Y’s LABA theater. Previously, Fringe Jr. plays had been shown at more than one venue each year. “The 14th Street Y has been a very good friend to us,” said Ben Cohen, an associate producer for Fringe’s community and social marketing. The venue, he said, was ideal due to the fact there are already other activities for kids going on, making it convenient for parents who want to introduce their kids to theater. The 14th Street Y and sustainability organization Just Food are again partnering with Mountain View Farms to bring locally grown, organic produce to CSA members every week from June to October. Community Supported Agriculture (CSA) is a partnership where community members purchase shares of the season’s harvest directly from the farmer and the 14th Street Y has been offering the program since 2008. Frances Anderson, a member of the 14th Street Y, has been a volunteer organizer for the program since it began. The CSA originally partnered with a different farm located in upstate New York but Anderson said that Hurricane Irene devastated their farmland in 2011, bringing a sad end to the partnership. Many of the farms upstate were scaling back after Irene but Just Food helped the CSA at the Y to connect with Mountain View Farm, which was a little more sheltered from flooding due to its location in Western Massachusetts, and so far the partnership has been working well. 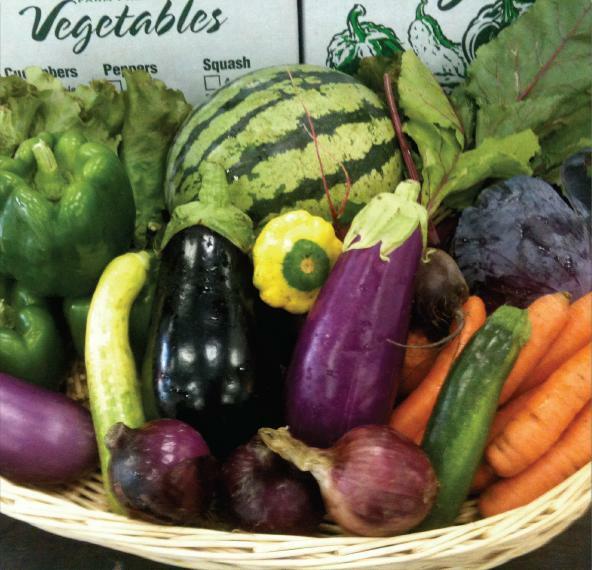 “We really appreciate the consistency in the quality and quantity of the vegetables we get from them, and because of the way in which they operate, with 90 percent of their clientele being CSAs as opposed to farmer’s markets, they just have a really consistent supply,” Anderson said. While the 14th Street Y provides infrastructure support for the CSA, Anderson said that it’s primarily a volunteer-driven program. Some volunteers dedicate more time than others but anyone who signs up for a CSA membership is required to work one shift throughout the season. This just means helping out with distribution for a couple of hours and the policy isn’t particularly strict. Summer and fall shares include carrots, bok choy, lettuce, beets, cabbage, kohlrabi, spinach, fennel, Swiss chard, cantaloupe, a variety of squashes, cucumbers, tomatoes, garlic, sweet potatoes, onions, scallions, eggplants, peppers and others. Mountain View Farm has partnered with nearby farms and orchards this year to add a fruit share, which will include strawberries, blueberries, apples and pears. Full shares, $600, are available for weekly pick-up and and half shares, $310, are collected bi-weekly. The shares are available to pick up on Thursdays from 4:30 to 7:30 p.m. in the lobby of the Y. A normal week’s share averages about $27. Anderson said that a full share every week is good for a family of four that eats a lot of vegetables. “My family of three gets a weekly distribution but for some families that’s way too much,” she said. She added that while half-shares come out every other week, it can involve a lot of planning to make sure certain things are eaten before they go bad and if there are individuals who want to participate, volunteers with the CSA can connect those people with each other to split a half share. Even with the most meticulous planning, CSA members are sometimes still overloaded with vegetables they are pressured to eat before they start rotting and Anderson said that they are hoping to offer some additional programming at the Y this year to help alleviate that problem. Anderson noted that even though there are some vegetables that don’t get claimed every week, none of it goes to waste. CSA membership is open to everyone, not just 14th Street Y members, and the deadline to register is May 30. For more information or to register, visit Mountain View Farm CSA’s website. 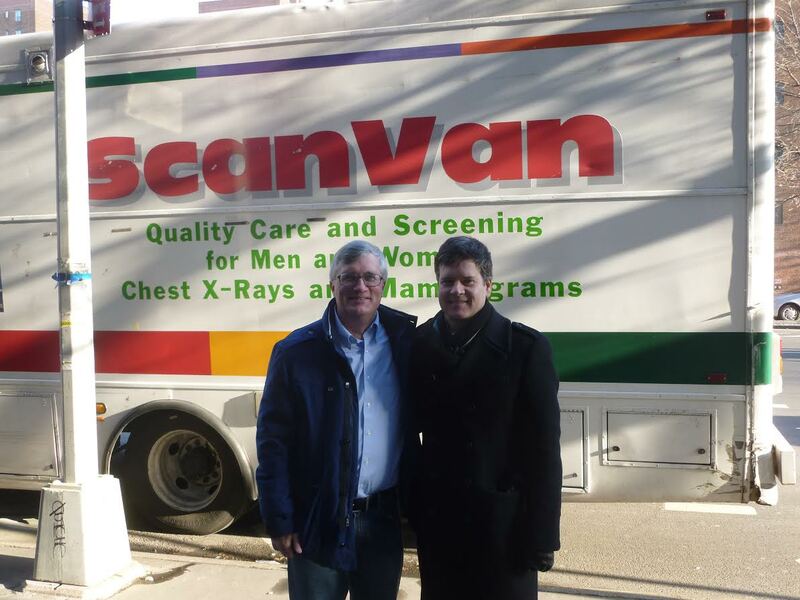 Following a successful event last month in which women 40 and older were offered free mammograms outside of Stuyvesant Town, the mammogram van is back today. The event sponsored by State Senator Brad Hoylman, is running now through 4 p.m. today on First Avenue between 16th and 17th Streets. Space is limited and appointments are mandatory. Call (800) 564-6868. All insurance plans accepted. Co-payments and deductibles waived. Free for women over 40. “Kaddish,” a play based on Nobel Prize-winner Imre Kertész’s novel “Kaddish for an Unborn Child,” will run January 10-13 at the Theater at the 14th Street Y. “Kaddish,” a one-man show featuring Jake Goodman and directed by Barbara Lanciers, comes to the Y following a critically-acclaimed run in Budapest this past June. The play is an exploration of ritual and loss. It looks at a father’s unrelenting conflict over the absence of the child he never had during his ultimately doomed marriage. A Holocaust survivor, he had refused to bring a child into a world where horrors like the one he experienced can occur. The longing and regret that haunt this character give rise to one of the most eloquent meditations ever written on the Holocaust. The production is intimate, featuring a solo performance by Jake Goodman on a 10-foot square stage covered in dirt and light. Performances (55 minutes in length) are Jan. 10 at 5 and 7 p.m., Jan. 11 at 11 a.m., 3 and 9 p.m., Jan. 12 at 1, 4 and 6 p.m. and Jan. 13 at 3 and 5 p.m. Tickets, $18, can be purchased at http://www.14streety.org/boxoffice or by calling 1-800-838-3006. The Theater at the 14th Street Y is located at 344 East 14th Street between First and Second Avenues. On Saturday, January 11, 2014 the sixth annual Bobby Fulham Epiphany Alumni basketball game will be held at Xavier High School in the main gym, 30 West 16th Street between Fifth and Sixth Avenues. Doors open for registration and warm-ups at 6 p.m. The ladies’ game is at 7 p.m. Men’s game to follow. The late Bobby Fulham, a resident of Stuyvesant Town, was a good friend to many families in the neighborhood and was instrumental in getting the Epiphany Basketball Program to the level it is at today. Fulham lost his battle to cancer five years ago this past November. Every year many former players return to play in the game in his honor. All of the proceeds of this year’s event will be donated to the CYO Basketball and the Epiphany School basketball program. Admission is a $20 donation, which includes a commemorative t-shirt, $5 for students and kids. Players are also asked to donate $20. All checks should be made out to CYO. For more information, contact Ray Curley (rtcurley99@aol.com), Tom Issing (tgi32@aol.com) or Mike Nealy (Michael.nealy@admlaw.com). On Sunday, January 12 at 9 a.m., Anne Lazarus will lead a bird walk through Stuyvesant Cove Park and Stuyvesant Town. This free event will begin at the 20th street entrance to Stuyvesant Cove Park near the rocky outcropping, continue through the park and end in Stuyvesant Town. Possible bird sightings include several winter water birds as well as some interesting ducks. It is also hoped that the Varied Thrush, a rare bird recently spotted in Stuyvesant Town, will stay in the area until then. The walk will last approximately two hours and will take place even in the event of light rain. All are invited to participate and encouraged to bring cameras and binoculars. The Stuyvesant Cove Park Association would love to receive any photos of birds spotted on the walk. They can be sent to stuyvesantcove@yahoo.com. The Kips Bay Neighborhood Alliance is holding a fundraiser at Hill & Bay, 581 Second Avenue, on Monday, January 13 from 5:30 to 7:30 p.m. to raise awareness and membership. The event will give residents a chance to meet their neighbors, community leaders and local elected officials. The $20 suggestion donation for the event includes annual membership to the KBNA, one drink ticket and appetizers. There will also be a cash bar available. For more information, contact kbna.info@gmail.com. Stuyvesant Town and Tompkins Square Park will be participating as chipping sites in MulchFest on Saturday, January 11 and Sunday, January 12 from 10 a.m. to 2 p.m.
At this event, New Yorkers are encouraged to bring their discarded Christmas trees to be recycled into mulch. The site at Stuyvesant Town will be at the East 20th Street Loop and the site in Tompkins Square Park will be at East 7th Street between Avenues A and B. Free mulch will be available at each chipping site. Trees can also be brought to a drop-off site beginning on January 4 through January 12 to be recycled later. Special curbside collection for mulching and recycling of trees will be conducted by the Department of Sanitation from December 30 to January 15. New York Cares is working with Community Partners in NYC to distribute coats to New Yorkers in need. A temporary bin has been set up at Oval Concierge to make it easy for PCV/ST residents to donate new or clean, gently used jackets and coats from Thursday, January 9 through Wednesday, January 15 at Oval Concierge (276 First Ave). For listings om local entertainments events: concerts, theater, comedy, burlesque, art exhibits, kids’ events, discussions and more, see T&V’s Around & About page. For listings on local health and fitness events: support groups, screenings, classes and more, see T&V’s Health and Fitness page. For listings on events held at local houses of worship: talks, special services, classes and volunteer efforts, see T&V’s Religion Page. Director and producer Karen Loew premiered her short documentary film, Intersection: Babel at the LABA Festival, which was hosted by the 14th Street Y last week on May 19th. As previously reported by T&V, the film is about the intersection of First Avenue and 14th Street, which inspired Loew because she lives close by. The film’s Facebook page can be found here and the movie can be viewed below.